Pizza, chicken tenders, fish sticks, hot dogs, French fries, tater tots, jello and chips are all too common staples served to U.S. students — resulting in school lunches that are consistently high in saturated fats and sodium. 34% of the calories in a typical school meal come from fat. When I first toured our local elementary school, the principal stated that a kid could conceivably choose to eat pizza every single day. Certainly some do. Parents have ready access to information about what their kids are eating — most school districts now post menus online. For example, see a sample menu from the Chesterfield County Public Elementary School. For this particular week, on Monday, kids could pick between Hot Dog on a Bun, Chicken Fillet Sandwich, a Peanut Butter & Jelly Sandwich or Entree Salad. They could then select two additional add-ons from: potato, tossed salad, baby carrots, fruit or juice. A study of 1000 Michigan sixth graders found that those who regularly ate school lunches were 29% more likely to be obese than their peers who brought home-made lunches. Of course there is no guaurantee that lunches brought from Mom and Dad are home-spun marvels: Pre-packaged “Lunchables,” potato chips and peanut butter and jelly sandwiches are laden in fats and salt. Children raised on the concept of fast food and “kid foods,” including Happy Meals, Fruit by the Foot, Dora the Explorer yogurt, Goldfish, and Scooby-Doo Macaroni & Cheese have acquired a persistent taste for salt, fat and sugar. Parents have an obvious role to play in modeling healthy eating. The U.S. is behind the game. Other countries have already launched improvements to school lunches. Take a look at a visual comparison of U.S. lunches to those from around the world. South Korea’s selection of Mushroom soup, rice, egg, tofu, kimchi and bean sprouts look far healthier, but most likely not to the taste of a majority of American kids. 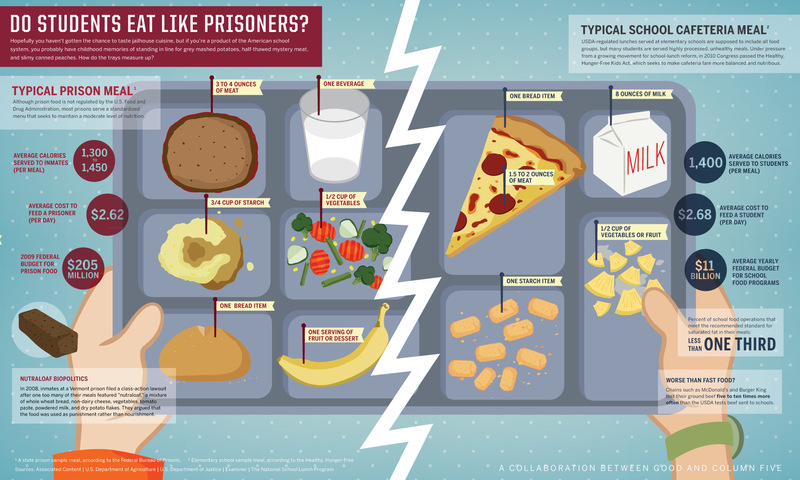 A recent infographic from the website GOOD compared school lunches with prison food. Guess which turned out to be superior? An average prison meal includes more protein and vegetables than a typical school meal. 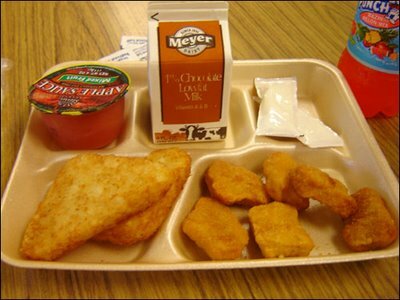 A school meal is even worse than fast food: McDonald’s tests their ground beef five to ten times more often than the USDA tests beef sent to school. The first new nutritional standards in fifteen years are being imposed by the U.S. Department of Agriculture, part of the Healthy, Hunger-free Kids Act of 2010. Unveiled in January, these measures would limit the caloric count of meals served – and add whole grains, fat-free or low-fat milk, as well as more variety in fruits and vegetables. New limits will restrict sodium, saturated fat and trans fats. Flavored skim milk will be on the menu – due to persistent lobbying by the dairy industry. The National School Lunch Program, created by President Harry Truman in 1946, is a federally-funded program to provide free or reduced-price meals to children from low-income families. For the 2009-10 school year, 31.6 million children participated on a daily basis. Unfortunately, the lunch program is tied to another historic monstrosity: agricultural subsides. 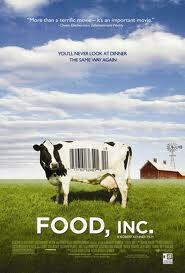 The U.S. government encourages over-production of dairy, corn and beef by subsidizing these industries. According to basic economic theory, a surplus would normally drive down prices. So the government buys these food surpluses and provides the products to schools. Note that very few of these subsides go to growers of broccoli or spinach. One basic problem is that very few adults eat what our kids eat. In one district, an anonymous “Mrs. Q” committed to eating 162 school lunches. She blogged about it on Fed up with Lunch, describing her experiences consuming popcorn chicken, bagel dogs, applesauce, and red-colored ice. Pizza was typically served once a week. She noted that kids only had 20 minutes to eat lunch, so many kids began by eating dessert. There have been many local attempts at innovation. School districts have experimented with food presentation, providing artfully-arrayed locally-grown fresh choices instead of processed food slapped on a tray. One school district used psychology to influence kids’ choices. renaming foods, such as “x-ray vision carrots” or “lean, mean green beans.” Chef Alice Waters of Chez Panisse in Berkeley began the Edible Schoolyard Program, creating student-run farms where kids could grow what they ate. Josephine Lauer runs the Organic School Project to encourage healthy choices in Chicago schools. In California, the Golden Carrot program encourages alternative, sustainable nutrition in schools. Information and sample menus, including vegetarian options, can be found on this site from the Physicians Committee for Responsible Medicine. Of course, gardens aren’t an option for a school in the inner city. Funding remains an obstacle for poorer districts, when budget cuts are requiring schools to cut back on basics. Let kids create: Making your own salad is a lot more appealing than the same old green beans or chopped carrots. Go with fresh instead of processed: crunchy carrot sticks or snap peas are more appealing than mushy canned peas. Provide apples over applesauce, cherries over red-flavored ice. 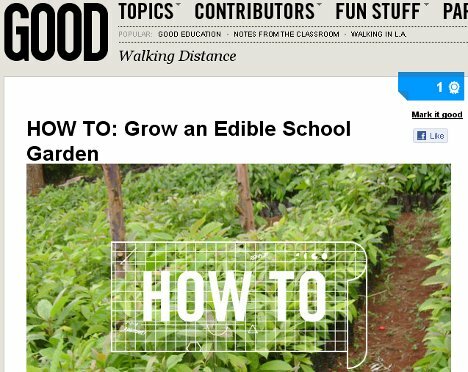 Let kids see where food comes from: many schools have had success with gardens, where kids tend tomato and zucchini plants. Kids are much more likely to eat what they’ve participated in growing. This doubles as a lesson in science and business. Stop letting agricultural subsidies decide what’s on the menu. School lunches have a surfeit of high fat dairy products, corn and high fructose syrup. Avoid fried and processed foods as much as possible. Challenge kids beyond the narrow range of so-called “kid foods.” Kids can learn to eat grilled chicken instead of popcorn chicken, roasted potatoes instead of french fries, baked zuccini instead of hot dog on a stick. Try an international flair. This doesn’t mean cheesy nachos, but perhaps Thai coconut vegetables or Indian chicken curry. Pass out chop sticks instead of plastic forks to stimulate interest. Have school officials eat with the kids. If principals and teachers ate the same foods as the students, they would most certainly demand improvements. We can do better. Our children deserve better. Stumbled upon you. Your piece is spot-on. Children do deserve better.